Born: 6 October 1863, Durban, South Africa. Died: 29 September 1950, Durban, South Africa. Walter J. Haygarth was the youngest son of Joseph Williamson Haygarth, whose sister was married to the botanist John Medley Wood*. Wood adopted the young Walter. He was apprenticed to the Natal Government Railways workshops in September 1883. In September 1889 he was appointed as draughtsman and assisted in teaching the railways' drawing classes. Eventually he became a chief draughtsman, until his retirement in 1915. He married Eliza Priscilla Wood in October 1894 and they had two children. In addition to outdoor sports, Haygarth's hobbies related to botany and invertebrate zoology. He collected some 200 specimens of plants in Natal and East Griqualand for Wood, who was in charge of the Natal Government Herbarium. He also contributed some illustrations to the first volume of Natal Plants, published by Wood and M.S. 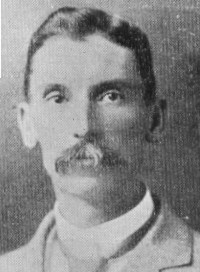 Evans* in 1899. His plants ended up in various local and overseas herbaria. A few specimens of Crassula that he had collected, together with others collected by Wood and F.R. Rudolph Schlechter*, were described as new species by S. Schonland* in 1897. He was commemorated in the names of the alga species Chlorophytum haygarthii (named by Wood and Evans), and in Cerophegia haygarthii, named by F.R.R. Schlechter*. In 1912 Haygarth donated ants from Durban to the South African Museum, Cape Town. He also collected land snails in Zululand for H.C. Burnup* and the species Trachycystis haygarthi (Haygarth's pinwheel) was named after him. Herbert, D. & Kilburn, D. Field guide to the land snails and slugs of eastern South Africa. Pietermaritzburg: Natal Museum, 2004. National Automated Archival Information Retrieval System (NAAIRS). http://www.national.archives.gov.za/naairs.htm Documents relating to Haygarth, Walter Jaques / Haygarth, W.J. Pietermaritzburg Archives Repository (NAB), Source MSCE, Reference 2242/1950. Death notice, Walter Jacques Haygarth. Downloaded from http://www.eggsa.org/documents/main.php?g2_itemId=521023 on 2017-6-27. Robertson, H. Biodiversity explorers. http://www.biodiversityexplorer.org/people as on 2017-6-27. Schrire, B.D. Centenary of the Natal Government Herbarium, Durban, 1882-1982. Bothalia, 1983, Vol. 14, pp. 223-236.